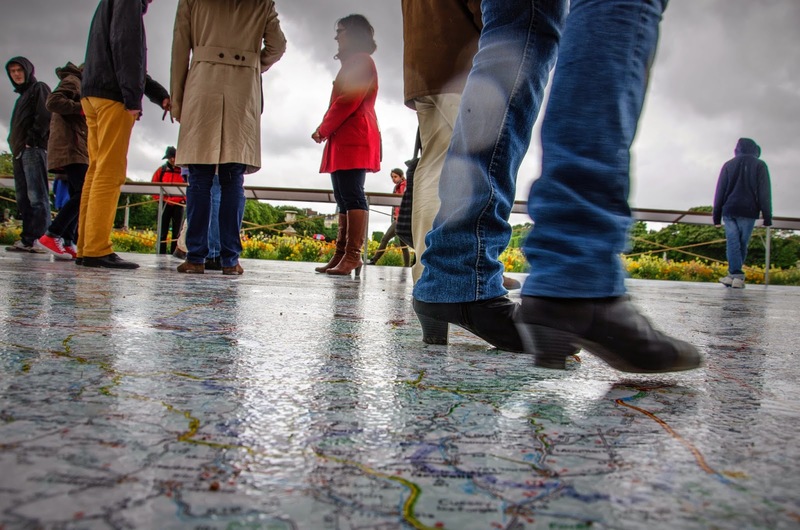 Yes it's a map and yes people are walking on it! Why? Because it's meant to be that way! To commemorate the 100th anniversary of WWI, the Senate - withe the help of map maker Michelin - put a giant map in the Luxembourg gardens on which it is possible to see the major battles that took place in the North-East of France. Very clever idea, even on a rainy day like yesterday! On the Luxembourg grids that surround the gardens, you can also see photos that were taken on the battle fields by photographer Michael St Maur Sheil. More (in English and in French). An interesting way of getting the public engaged in the story. One of our papers has two journalists spending a couple of months going around the western front. Photo Riga, in this case celebrate doesn't mean to glorify or revel in the war, but to memorialize the war. It is a remembrance of the war. I'm sure it is quite thought provoking. Thanks for the photo Eric. I would love to be in Paris to see the map even in the rain. Great idea—and your photo is classic Tenin! Love the Tenin perspective. This map is such a great idea to get people talking and thinking. Will make a point to go and see it next month. It was ANZAC ( Gallipoli) day last Friday but the Anzacs liberated Villiers-Bretonneux on April 25th 1918 also. I love the Tenin perspective of the map too. Michael's photos are haunting and sad yet beautiful. Interesting, I must say... You always know how to find out informative posts and original scenes. I love it.